super energy saving temperature and humidity management! exhausted by all electrification dwindling fuel not used! CO2 emissions are also reduced! 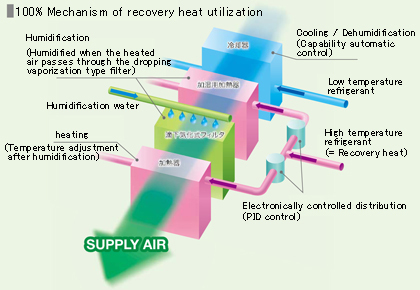 Cooling dehumidification mechanism · heating mechanism · humidification mechanism → All in one! 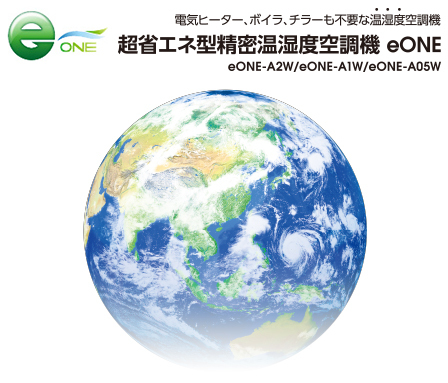 Because eONE is a refrigerator integrated type, 100% recovered heat utilization (temperature / humidity) technology (patent: No. 4593689) was realized. 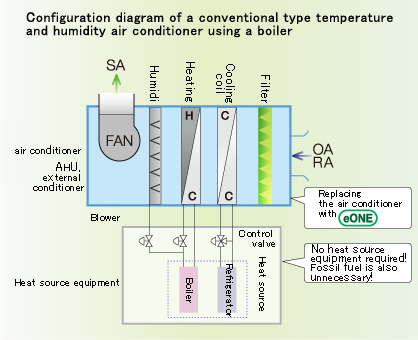 * Comparison with air conditioning equipment that processes heating and humidification with electric heaters. 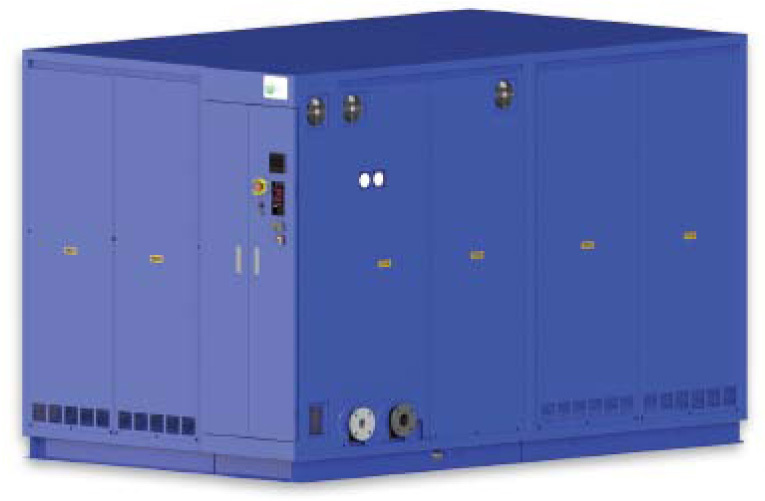 This is only eONE that you can use 100% recycling heat with a large air volume equivalent to ~ 360 m3 / min and both heating and humidifying. Cut the running cost up to 80% *. ● The powerfulness of the device equipped with the direct expansion chiller & the electric heater is as it is! FeaturesⅢ Excellent control stability with less temperature and humidity fluctuation! ＊ This is a relative value representing the temperature and humidity fluctuation range (the difference between the highest value and the lowest value) at the time of control stability and does not indicate absolute accuracy. 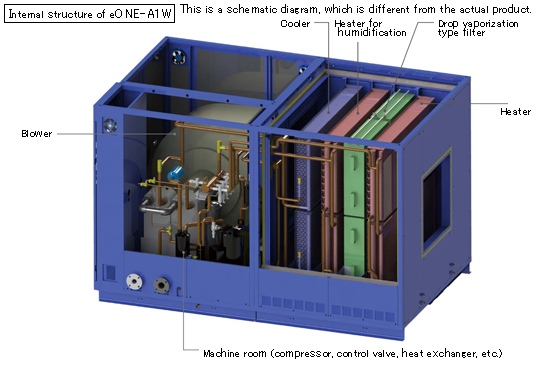 Direct expansion chiller & electric heater mounted type precision air conditioning equipment has been uneasy about the control stability necessarily because the air is partially heated by the heater and humidified steam is mixed later.The eONE – A1W / eONE – A 05 W realizes more precise control stability because it efficiently cools, dehumidifies, humidifies and heats the entire surface through which air passes. Always monitor coolant inlet coolant temperature at point A and refrigerant outlet refrigerant temperature at point B and PID control the expansion valve to achieve the proper degree of superheat [B - A].This maximizes the cooling rate and at the same time prevents liquid return to the compressor. 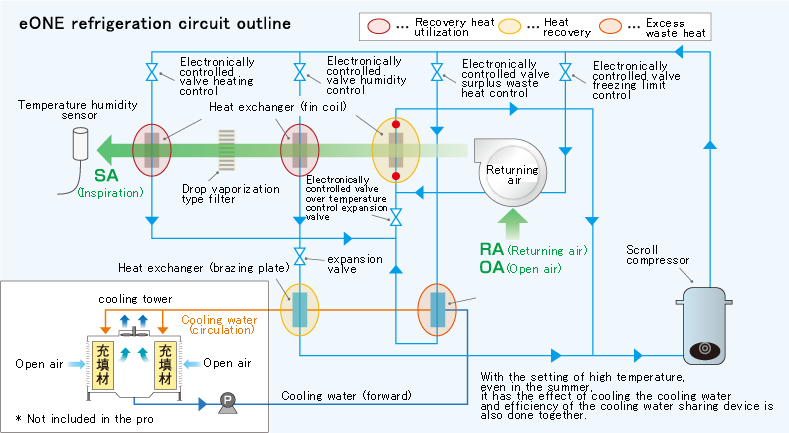 Always monitor the coolant inlet refrigerant temperature at point A and PID control the flow rate of hot gas so that point A maintains the freezing critical temperature.This maximizes the cooling efficiency and at the same time prevents freezing of the cooler. eONE constantly monitors the refrigeration circuit pressure and PID controls the hot gas bypass flow rate so that it does not become a dangerous high pressure condition.This makes it possible to control the control temperature range up to 50 ° C.
FeaturesⅤ All functions and control are integrated on one board! 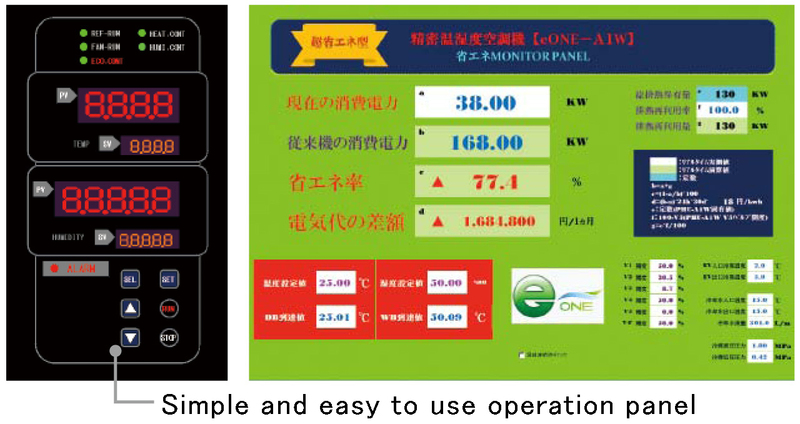 Improvement of electricity can be “visualized” in real time with standard software “energy saving monitor”. In addition, various control states and driving conditions can be monitored in real time.